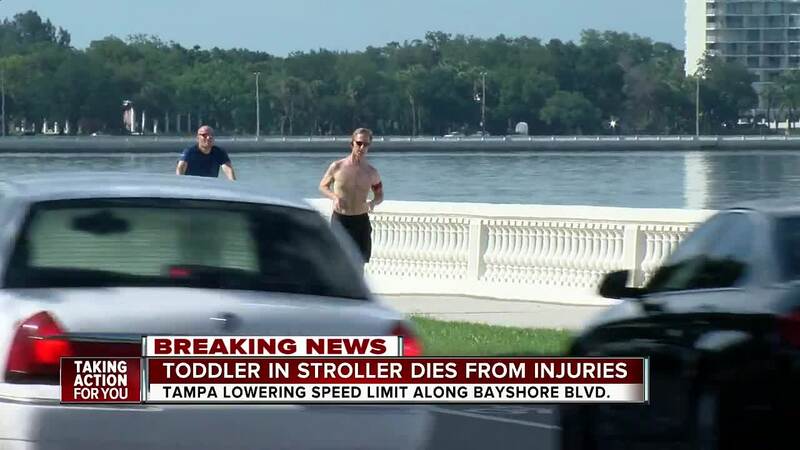 TAMPA, Fla. — The City of Tampa will be reducing the speed limit on Bayshore Boulevard to 35 mph starting Friday after a mother and toddler were killed by street racers while crossing the road. The city will begin replacing all speed limit signs on Friday. They have already begun putting up temporary speed limit signs in the meantime. "Over the next few days, the City will speed up an already planned phase of the Bayshore Boulevard project. TPD traffic enforcement will continue and officers will incorporate the new speed limits as the signs are erected. There will be message boards along the road notifying drivers of the change for the next few weeks," the city wrote in a press release. City officials already had planned to reduce the speed on Bayshore from 40 mph to 35 mph in order to improve safety. However, the plan was not going to be implemented until October. Group aims to lower speed limit on Bayshore Blvd. Along with reduced speed limits, the City of Tampa has three proposed crosswalks going in along South Dakota, South Delaware Avenue and near Brevard and Swann Avenues. The city has been working on a three-phase project that started in 2006, to see the project, click here. The Ohio mother and child hit and killed crossing Bayshore were near Knights Avenue, ABC Action News looked into how far that would be from the closest crosswalk going in and found it's around two miles away. City of Transportation Director Jean Duncan tells ABC Action News they have only been able to fund three crosswalks so far, but hope to add more. However, there is no timeframe for when that could happen. In fact, Duncan said they only recently got a permit to put in three crosswalks. "We only got our clearance two weeks ago to put them in from the federal highway administration," Duncan said. Duncan said it takes time, funding, and permits to add crosswalks. "I also understand folks feeling like you just get a can of paint and go out there, if we just got a can of paint and went out there, what kind of roadways would we have?" she asked. Duncan went on to say it takes data, engineers and studies to find the appropriate locations for crosswalks along roadways. ABC Action News also found Bayshore Boulevard does not have a single stopping point along for 1.8 miles. 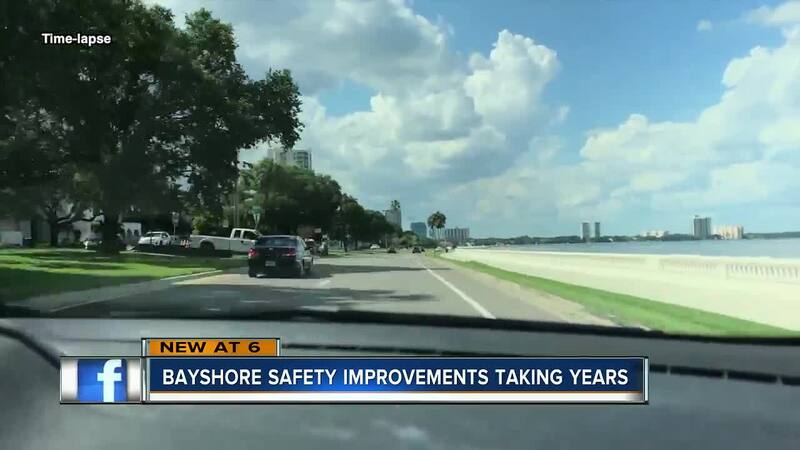 That's why parents like Kathy Yates say Bayshore Boulevard is treated like a highway. "There is no stopping points so they just go so fast," she said. "I honestly wonder if people even know the speed limits." Duncan tells ABC Action News that Bayshore does not meet the criteria for stop signs or another traffic signal. Members of Walk Bike Tampa say the speed limit reduction is not enough to keep pedestrians safe. "Unfortunately it's become more of a freeway as opposed to a linear park for all of us to enjoy," said Mary Jane Rickles. "We gave all of these ideas to the City of Tampa and asked them to please implement them so something like this wouldn't happen." ABC Action News has learned, a group of concerned South Tampa parents went to City Hall Thursday morning demanding safety improvements to the bustling, four-mile stretch of road. "If you don't speak up nothing is going to get done, people are just going to forget about it and move on," said Meghan Parrinello. The city says despite safety improvements, it can’t stop drivers from reckless behavior.